Galileo Galilei (Italian pronunciation: [ɡaliˈlɛːo ɡaliˈlɛi]; 15 February 1564 – 8 January 1642), commonly known as Galileo, was an Italian physicist,mathematician, astronomer and philosopher who played a major role in the Scientific Revolution. His achievements include improvements to the telescope and consequent astronomical observations, and support for Copernicanism. Galileo has been called the "father of modern observational astronomy", the "father of modern physics", the "father of science", and "the Father of Modern Science". Stephen Hawking says, "Galileo, perhaps more than any other single person, was responsible for the birth of modern science." The motion of uniformly accelerated objects, taught in nearly all high school and introductory college physics courses, was studied by Galileo as the subject ofkinematics. 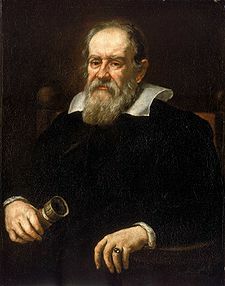 His contributions to observational astronomy include the telescopic confirmation of the phases of Venus, the discovery of the four largest satellites ofJupiter (named the Galilean moons in his honour), and the observation and analysis of sunspots. Galileo also worked in applied science and technology, inventing an improved military compass and other instruments. Galileo's championing of Copernicanism was controversial within his lifetime, when a large majority of philosophers and astronomers still subscribed to thegeocentric view that the Earth is at the centre of the universe. After 1610, when he began publicly supporting the heliocentric view, which placed the Sun at the centre of the universe, he met with bitter opposition from some philosophers and clerics, and two of the latter eventually denounced him to the Roman Inquisitionearly in 1615. In February 1616, although he had been cleared of any offence, the Catholic Church nevertheless condemned heliocentrism as "false and contrary to Scripture", and Galileo was warned to abandon his support for it—which he promised to do. When he later defended his views in his most famous work,Dialogue Concerning the Two Chief World Systems, published in 1632, he was tried by the Inquisition, found "vehemently suspect of heresy", forced to recant, and spent the rest of his life under house arrest. Although he seriously considered the priesthood as a young man, he enrolled for a medical degree at the University of Pisa at his father's urging. He did not complete this degree, but instead studied mathematics. Galileo was also studious of disegno, a term encompassing fine art, and in 1588 attained an instructor position in the Accademia delle Arti del Disegno in Florence, teaching perspective and chiaroscuro. Being inspired by the artistic tradition of the city and the works of the Renaissance artists, Galileo acquired an aesthetic mentality. While a young teacher at the Accademia, he began a life-long friendship with the Florentine painter Cigoli, who included Galileo's lunar observations in one of his paintings. In 1589, he was appointed to the chair of mathematics in Pisa. In 1591 his father died and he was entrusted with the care of his younger brother Michelagnolo. In 1592, he moved to the University of Padua, teaching geometry, mechanics, and astronomy until 1610. During this period Galileo made significant discoveries in both purefundamental science (for example, kinematics of motion and astronomy) as well as practical applied science (for example, strength of materials and improvement of the telescope). His multiple interests included the study of astrology, which at the time was a discipline tied to the studies of mathematics and astronomy.